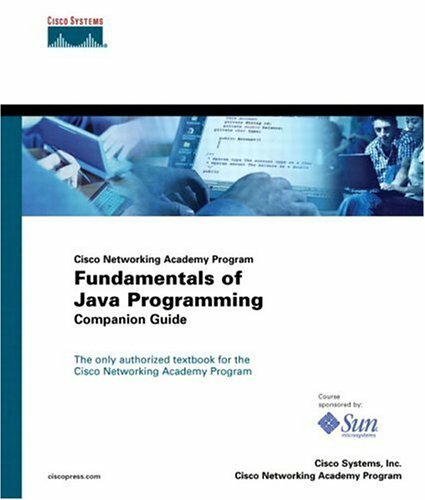 Cisco Networking Academy Program Fundamentals of Java Programming Companion Guide is the Cisco approved textbook that supplements the Sun Microsystems-sponsored Cisco Networking Academy(r) Program web-based curriculum. Java is a popular, multiplatformed, object-oriented programming language that focuses on object manipulation and interaction rather than programming logic (like C, C++). The in-depth coverage in this guide provides students with the necessary knowledge to help them prepare for the Sun Certified Programmer for Java 2 Platform and employment as Java programmers. The Companion Guide introduces students to object-oriented programming, language fundamentals, and the Java Application Programming Interface (API). Students will learn how to create classes, objects, and applications and use the Java language's object-oriented technologies to solve business problems. Cisco Press is a collaboration between Cisco Systems(r), Inc., and Pearson Education that is charged with developing high-quality, cutting-edge educational and reference products for the networking industry. The products in the Cisco Networking Academy Program series are designed to prepare students for careers in the exciting networking field. These products have proven to be strong supplements to the web-based curriculum and are the only print companions that have been reviewed and endorsed by Cisco Systems for Cisco Networking Academy Program use. This companion CD-ROM contains Java programming practice questions, interactive e-Lab Activities, BlueJ tutorials, Java 1.4 SDK versions, and documents of Java code examples used throughout the course. This book is part of the Cisco Networking Academy Program Series from Cisco Press(r). The products in this series support and complement the Cisco Networking Academy. If you have any questions about this product by Brand: Cisco Press, contact us by completing and submitting the form below. If you are looking for a specif part number, please include it with your message.